Summer Doty, right, looks at the judge while showing her Champion FFA Market Gilt on Monday in the ring against the Grand Champion 4-H Market Gilt for the right to be crowned the 2015 Champaign County Fair Grand Champion Overall Market Gilt. Triad High School junior Summer Doty continued her family’s storied tradition of showing grand champion pigs at the Champaign County Fair by repeating as Grand Champion Overall in Monday’s Market Gilt Show, joining her grandfather, the late Noel Brelsford, as a two-time winner. Brelsford showed the Grand Champion Open Class Barrow at the fair in 1959 and 1962. Summer, who first competed at the fair in the PeeWee Swine Showmanship event at the age of 3, started the day by showing the Champion FFA Market Gilt and Reserve Champion FFA Market Gilt before entering the show ring to vie for the top trophy against Lauralee Lenhart’s Grand Champion 4-H Market Gilt. In the end, the judge sided with Summer and her 258-pound gilt. With two Grand Champion Overall Market Gilt show titles to her name along with the countless other awards she has won over the years at the fair, Summer said, the key to her success starts and ends with dedication and hard work. “The amount of work and effort that you put in is kind of what you get out,” she said. 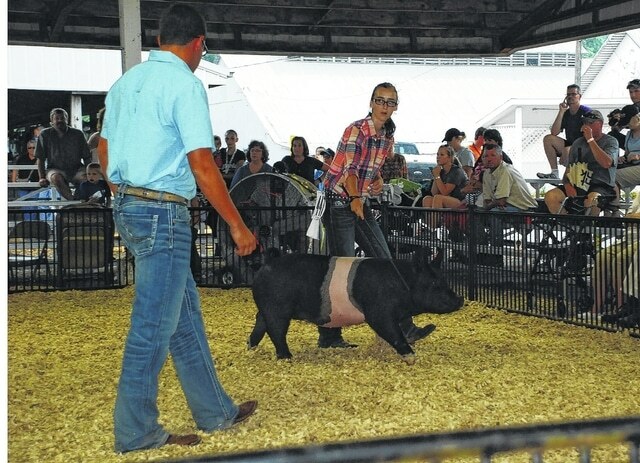 Summer’s family owns Mingo Valley Show Pigs. https://www.urbanacitizen.com/wp-content/uploads/sites/36/2015/08/web1_Doty2.jpgSummer Doty, right, looks at the judge while showing her Champion FFA Market Gilt on Monday in the ring against the Grand Champion 4-H Market Gilt for the right to be crowned the 2015 Champaign County Fair Grand Champion Overall Market Gilt.